Get here NDA Mathematics Answer Key 2019 Set C of exam held on 21 Apr 2019. Candidates who got Set C question paper in Maths of UPSC NDA/NA 1 2019 can check its answer key from this page below and download PDF. This NDA answer key contains correct answers of 120 questions asked in Mathematics Set C Question Paper. You can estimate marks out of 300 by using the NDA Maths Set C Answer Key before declaration of result of NDA 2019. NDA Mathematics Answer Key 2019 Set C can be checked given below after exam. Latest: Answer key of NDA 2019 Mathematics Set C, Question Paper, Expected Cut Off, Student Reactions, Analysis are now available. UPSC releases official NDA answer keys a long time after exam. Therefore the answer key of NDA 1 2019 Maths Set C that you get here just after exam is unofficial. However, we put all our efforts in ensuring that you get here correct answers of NDA Mathematics Set C Question Paper. 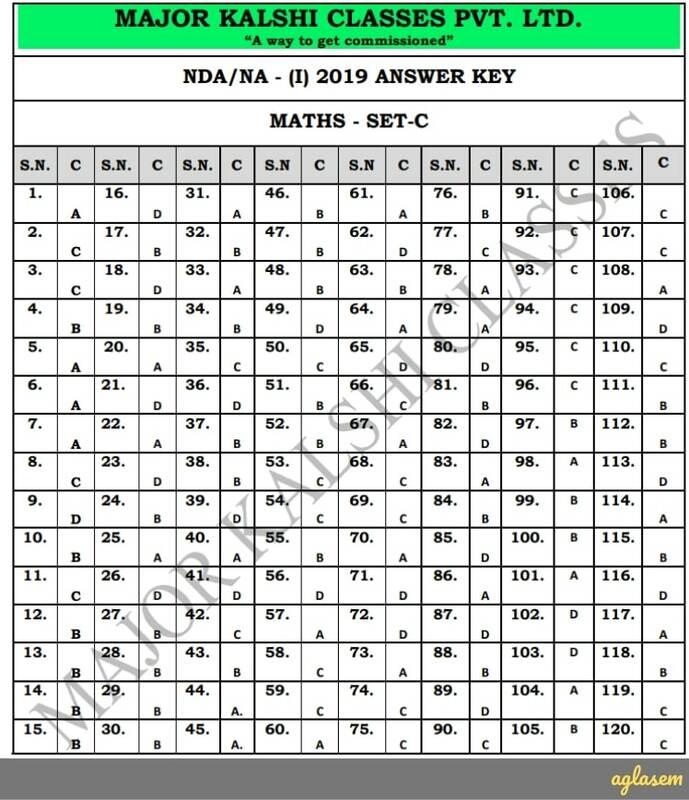 Now that exam has gotten over at 12:30 PM, you can enter correct answers in the real time answer key of NDA 1 2019 Mathematics Set C below. Click here to download answer key of NDA 1 2019 Mathematics Set C PDF. PDF version of the NDA 1 2019 Mathematics Question Paper of Set C is now available here after exam. Click here to download question paper of NDA 1 2019 Mathematics Set C. Or watch the video below. How to calculate marks using NDA Mathematics Answer Key 2019 Set C? Therefore, marks as per answer key of NDA 1 2019 Mathematics Set C = 2.5*Correct answers – 2.5/3 * Incorrect answers. Not only the NDA 1 Answer Key in fact all the answer key of the various examination helps the candidates in different ways. Check the significance of the answer key from below. With the help of the NDA 1 Answer key 2019 candidates can estimate their scores. Answer Key helps the candidates in predicting the chance of qualifying the examination which means the candidates gets the idea that whether he / she will qualify the NDA 1 2019 Exam or not. From the answer key candidates got to know about the correct answers. Answer key also helps the future NDA aspirants to know about the current year questions answers. On the basis of final official answer key candidates, marks are also calculated. It is also very important for the candidates to know that how to use the NDA Answer key because if the candidates do not know that in which way the answer key is used then you cannot calculate the correct scores. Read the below mentioned steps those will help you out in knowing that in what answer key is used. At first check your question paper set name and paper name / code then search the answer key for the same accordingly. Candidates will get all set answer key from this page. After getting the answer key of your respective question paper check the answers of the questions given in the paper do follow the sequence otherwise it may possible that you might get confused. Mark answers obtained from the answer key in the question paper. After marking all the correct answers in the question paper check that among all the question which of your questions answers are correct. On a paper write your total number of the correct answer and award the marks according to the marks given the question paper for correct answer. And do note for each incorrect answer do deduct the marks according to the negative marks described in the instruction part of the question paper. After adding and deducting the marks calculate the total scores. National Defence Academy (NDA) examination is conducted by Union Public Service Commission (UPSC) twice in a year. The applicants who have passed 12th standard are eligible to apply for the National Defence Academy (NDA). The selection of the aspirants in the NDA is done on the basis of offline examination (pen and paper based), Service Selection Board (SSB) Interview and Medical Test. The candidates who only qualified 12th standard those are trained in the Academy for 03 years ending in graduation with BA/BSc or BCs (Computer Science) degree from Jawaharlal Nehru. Let us know your feedback on NDA Mathematics Answer Key 2019 Set C in comments below. To discuss any question of NDA 1 2019 Mathematics Set C also you can comment below.